Want peaceful trickling water over mountain streambeds or do you prefer the thrill of rushing river waters powerfully cascading down rugged cliffs? New York waterfall tours have it all – and more! Did you know there are three waterfalls at Niagara Falls, and a few others nearby by car? The Niagara region is a great destination for waterfall tours! View the brink of Bridal Veil Falls, aka Luna Falls, from Luna Island and take the Cave of the Winds tour to get completely soaked by spray! Also nearby: Horseshoe Falls, Decew and Upper Decew Falls, Louth Falls, Balls and Lower Balls Falls, and, of course, the mighty Niagara Falls. For a memorable Hudson River Valley waterfalls tour, the impressive Buttermilk Falls has given rise to a 75-acre estate, an Inn and Spa. It’s been called a whimsical sanctuary, and with trails leading to ponds, plus lush gardens, charmingly decorated rooms, restaurant, modern amenities and frolicking alpacas, you’ll see why. Awosting Falls at Minnewaska State Park is worth the hike; Stony Kill Falls, too. Kaaterskill Falls, among the most popular Catskills trails, is an easy-to-moderate climb - and breathtaking! Swim in a stream-fed pond beneath a waterfall….sound perfect? Robert H. Treman State Park offers that, plus winding trails past 12 waterfalls, camping, hiking, all the rugged wild beauty that Ithaca is known for and more. Taughannock Falls drops 215 feet and is one of the highest falls east of the Rockies: you can swim, camp, picnic at the park, and there’s an annual lakefront summer concert series too. Looking for falls but no hiking? Aunt Sarah&apos;s Falls and She-Qua-Ga Falls in Montour Falls are easily seen from the road, and there’s a small park nearby with paved walkway and benches. Ausable Chasm in the primeval Adirondack Forest has been a go-to summer destination since 1870. The oldest natural attraction in the US has Elephants Head and Rainbow Falls, raft and tube rides, hiking, horseback riding, camping, and breathtaking scenery along walkways, bridges, and stairs. Explore dark pools, one of New York’s largest potholes and the spectacular 700-foot waterfalls at High Falls Gorge, or visit the historic sawmill waters and waterfalls at Natural Stone Bridge and Caves. Fit hikers gravitate to the ruggedness of the nearly 14-mile round trip to Wanika Falls, on the Northville-Lake Placid Trail (NPT). Camping at High Falls Park on the Chateaugay River has the added bonus of nature trails with views of a 120-foot waterfall. And there are many more trips to Adirondacks Waterfalls for all levels of hiking ability! Little Chautauqua Creek Gorge is a lovely natural respite with flat rocks for sunbathing near cascading creek waters, and Zoar Valley offers unspoiled wilderness and dozens of waterfalls. 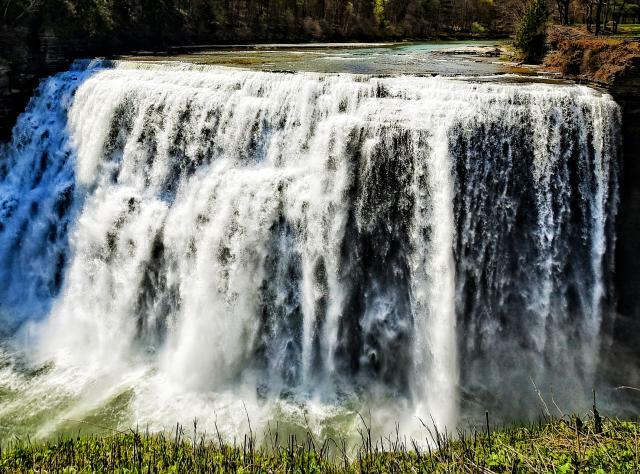 There are 66 miles of hiking trails at the “Grand Canyon of the East” on the Genesee River, or you can view the magnificent Letchworth Falls aloft on a hot air balloon ride! Or discover your own favorite waterfall tour with this handy list of Famous and Lesser-Known Waterfalls.